After apple picking this year, I came home with a huge bag of apples. I happily ate them plain for a week. But despite my valiant efforts, I had quite a few leftover, getting softer and mealier each day. I’ve baked an apple crisp before but it took more than an hour in the oven. With microwave apple crisp though, there’s no need to wait that long. You can make a single serving in less than 5 minutes and it’s just the right amount for a healthy snack or dessert. And with Thanksgiving come and gone, you can always keep the taste of our favorite turkey day alive. The recipe is super simple. You don’t need any cooking skills or special equipment and the ingredients list is short (apple, oats, sugar, butter, cinnamon). In fact, your dining hall probably has a lot of these ingredients, so you can nab them there. Are you ready to end your holiday marathon with a bowl of warm, fresh apple crisp? Apple: Any type of apple works. Softer apples result in a softer apple crisp. You can also try other fruits: pears, peaches, plums. 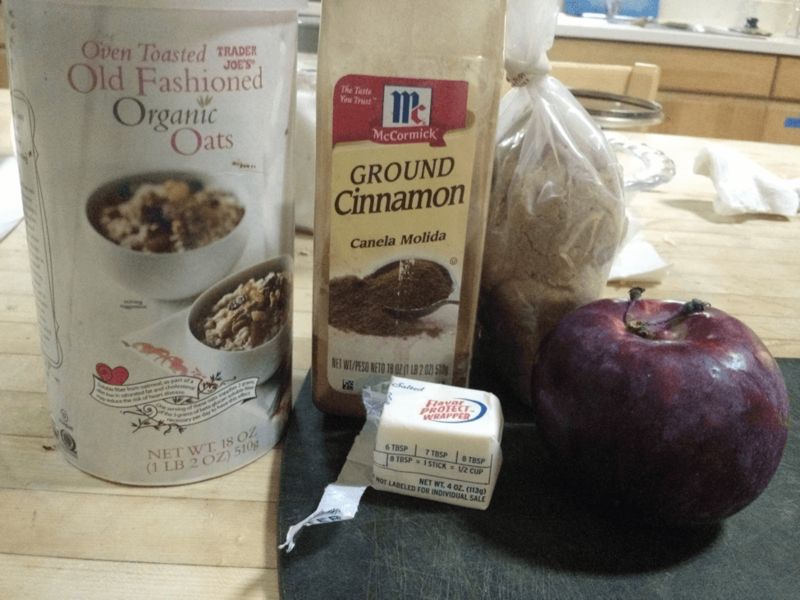 Oats: Used for topping the apple crisp. Traditional or quick oats would work. Steel cut oats or oat bran won’t soften properly. Cinnamon: Adds flavor. Can also add a small pinch of other apple pie spices, such as nutmeg, cloves, allspice or ginger. Butter: Adds buttery flavor. Substitute coconut oil for a vegan option. 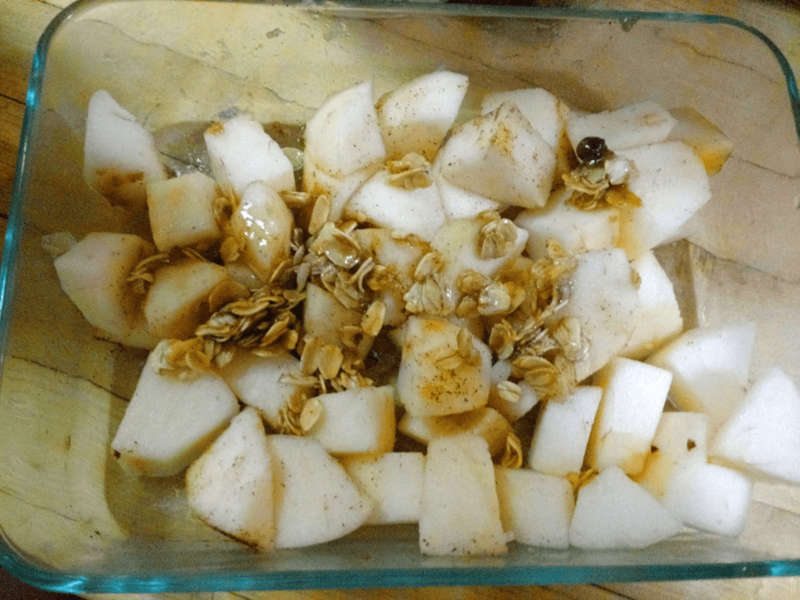 Brown sugar: Sweetens the apple crisp. Add up to 2 tablespoons. Alternatively, add up to 1 tablespoon of liquid sweetener, such as honey or maple syrup. 1. Peel the apple. 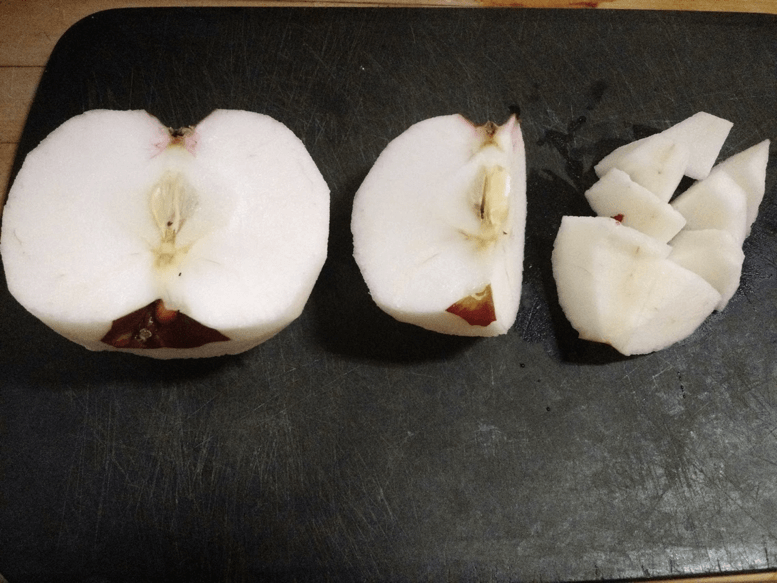 To dice it, I cut the apple into quarters, cut out the core of each quarter and then cut each quarter into 6-8 pieces. 3. Add all of the ingredients to the bowl. Stir to combine. Microwave for 2 minutes until the apples are soft. 4. Serve immediately. For a filling breakfast, top with Greek yogurt. For a more decadent treat, top with vanilla ice cream or whipped cream. Send us your apple crisp photo on Twitter @CollegeMag. Elaine is a 2nd year computer science major at MIT. For fun, she climbs rocks or bakes an absurd number of muffins, usually four dozen at a time.